Things Get Painted - Can't see the MDF for the trees! So this should be a quick post. Over the last week, in small moments of downtime, I've constructed some semi-pre-built terrain. They have stayed in their boxes until last Friday. 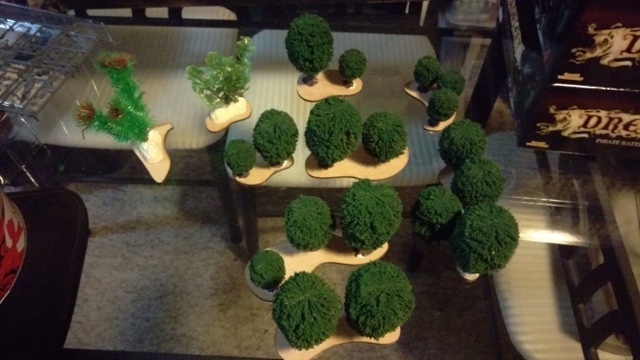 I had grabbed some MDF terrain bases from Aetherworks, and while watching Critical Role, I dunked the bottom of each tree into pva, then placed it on the base, sticking 2-3 trees on each. So, this is a quick update on what I've been up to. 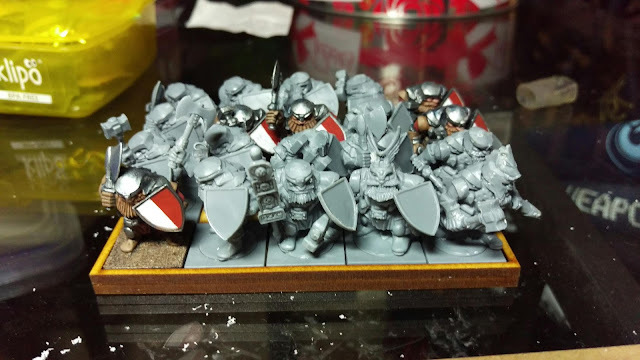 Mainly I've been focused on assembly lately, with only a few actual painting sessions.The Dwarves are from Mantic, and despite the fact I didn't plan ranking them up until halfway through the build, they ranked up pretty well!The two men are from the Wyrd multipart kit, and will form two of four demo characters for Through The Breach. The crouching guy will be the caster of the group, and the other will be the doctor.Finally, I got some paint on a few more of my McMourning crew. I grabbed a few hours when no one turned up for games to get some basic work done.